Visiting London last week, I took the opportunity to grab photos, in the rain, of a couple more long-closed Woolworths stores, adding to the six old Woolies shops – in Harrow, Pinner, Edgware Road, Brentford, Kingston-upon-Thames and Amersham – that I captured back in May. One of the fascinating aspects of Woolworths’ history is the extent to which it had already virtually withdrawn from central London, many years before the business collapsed at the end of 2008. Look at those Greater London stores that were open until the bitter end, and you’ll see that most were located on the conurbation’s suburban high streets. 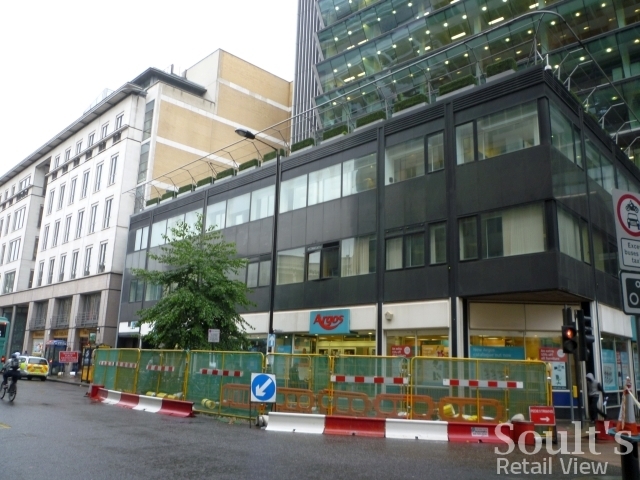 Go back to the 1970s, however, and you could find a large branch of Woolies in some of the capital’s most prominent retail thoroughfares, such as High Holborn (store #173, closed in 1984), Strand (#188, closed in 1983) or Oxford Street (#161). 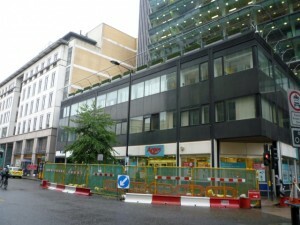 In London, as in major cities elsewhere (such as Newcastle), the 1980s seems to have been characterised by Woolies pulling out of its flagship sites – not necessarily because the sites were unprofitable (often the opposite was the case), but driven, as I understand it, by a desire to generate and reinvest revenue from the sale of these prime properties. 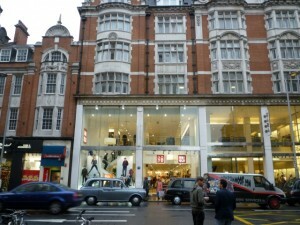 Both the old stores that I visited in central London seem to be cases in point. 100thBirthday.co.uk sets out a complicated (and not entirely clear) history of the former Woolworths in Wilton Road (#800), close to Victoria Station, which was recalled by John in response to my previous London post. Built in the 1950s and closed in 1984, the modern corner property – now housing a branch of Argos – barely looks any different to how it did in the 1960s, though it seems that the old Woolies store extended into the building next door as well. 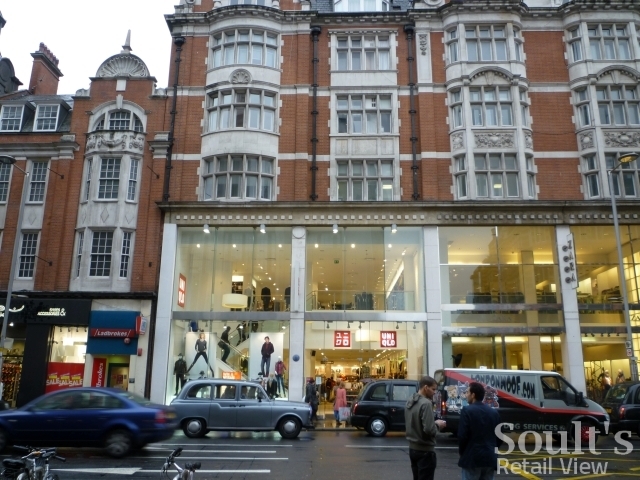 Over in Kensington High Street, the old Woolworths there (#162) was another 1980s disposal. Though the ground and first floor frontage of the property, which now houses the Japanese fashion retailer Uniqlo, has been transformed from its 1960s appearance, the distinctive second floor windows ensure that there is some sense of continuity between that shot and my own. While the Kensington store was long gone by the time of Woolies’ eventual demise, nearly thirty years later, the rationale behind its sale can be seen, in hindsight, as part of the drift that would ultimately sow the seeds of the retailer’s collapse. After all, who knows how history might have turned out if, instead of snapping up other retailers in the 1980s, Woolworths’ owners had chosen to focus their attentions on the core business – a chain that, even then, was losing its raison d’être, and would ultimately never get it back. I last went in that Wilton Road branch of Woolworths in 1975. My recollection is that it occupied the entire block and I got the impression that it was like a series of adjacent shops where doorways had been knocked through from each to the next. Now as a young teenager in 1967, I went to Harlow with a group of school friends in the lead up to Christmas, which would have been around the time of that black and white photograph. And silly as that statement seemed at the time, he was right.